After a lot of speculation and waiting Apple finally revealed a set of new iPads to the world a few weeks ago. While we still are waiting for the new iPad Mini we have gotten our hands on the new iPad Air and are putting it through the test to see if it is a worthy successor for the previous models. The new iPad Air comes with a much sleeker body as well as upgraded innards making it one of the best ~10 inch tablets available right now. The model we are testing today is the 16 GB WiFi-version that retails for $499. I admit it. I was one of those who doubted that a tablet really was useful and would be successful. And I was wrong. There is a definitely use case for tablets both as entertainment products and in some cases even products for those who need to be productive. The iPad has long been synonymous with tablets mainly because it started the tablet revolution, but also since Apple has managed to produce very good products. Lately though the market share has started to dip under the onslaught of Android tablets, and to a lesser extent, the Windows tablets. One could therefore argue that the new iPads are important for Apple to remain competitive. 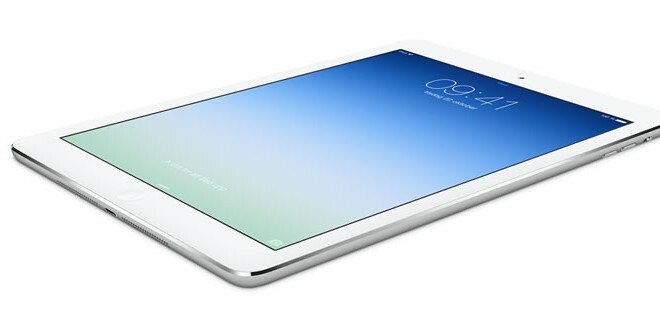 Apple has done two main upgrades with the new iPad Air. First of all they updated the guts of the iPad with the same SoC (System on a Chip) as the iPhone 5s: the Apple A7. The Apple A7 is a 64-bit chip, which has been designed by Apple. While many Android-competitors boasts about quad-core CPU’s Apple has put a 1.4 GHz dual-core CPU based on the ARM A8 and coupled it with a PowerVR G6430 GPU. 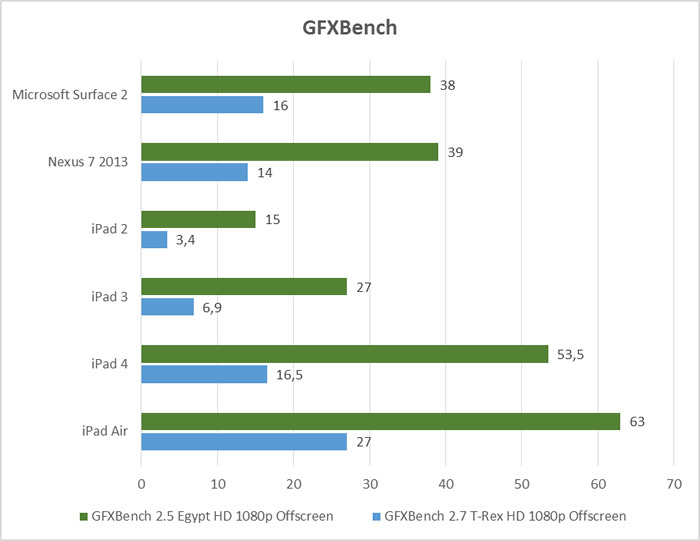 This gives the iPad Air more than double the performance of the iPad 4 (at least according to Apple). The other big upgrade is the slimmer and thinner package. Apple has taken the design language for the iPad Mini and applied it on the iPad and created a really nice and slim ~10 inch tablet that feels much smaller than it is. A quick look at the table reveals that Apple has taken the design language of the iPad Mini and applied it here on the bigger iPad. The result is quite frankly stunning. 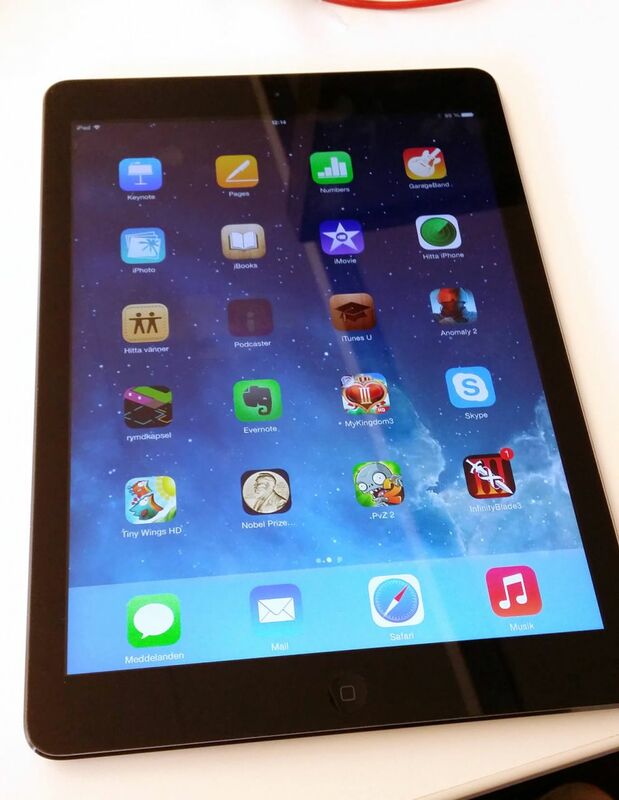 In this picture we see the new iPad Air to the left and the iPad 3 to the right. 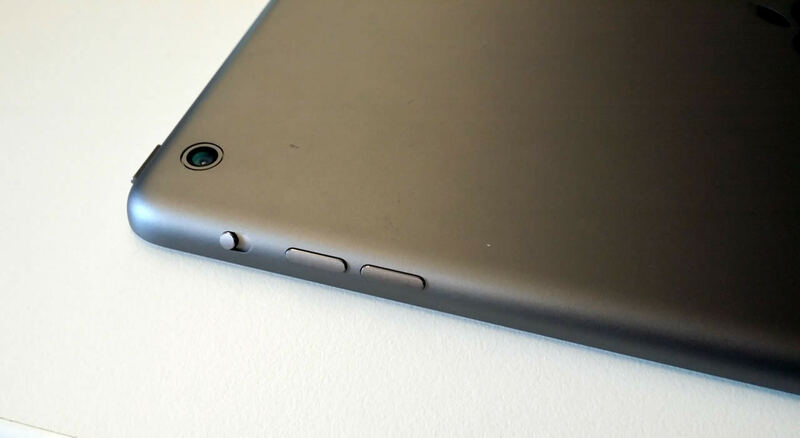 Not only is the iPad Air much thinner but the slope on the edges makes it feel a lot smaller than it actually is. Other than the new design there are not any new features. Apple did not include the fingerprint sensor from the iPhone 5s so you still have to unlock using a code. Apple has put two speakers at the bottom of the device. Apple has put two buttons for volume up and down in addition to the switch which for example can prevent the screen from changing orientation. The screen is just as nice as on the iPad 4. It has great viewing angles and the ppi is high enough that you do not see the individual pixels unless you use a magnifying glass. So, we like the hardware but how about the software. 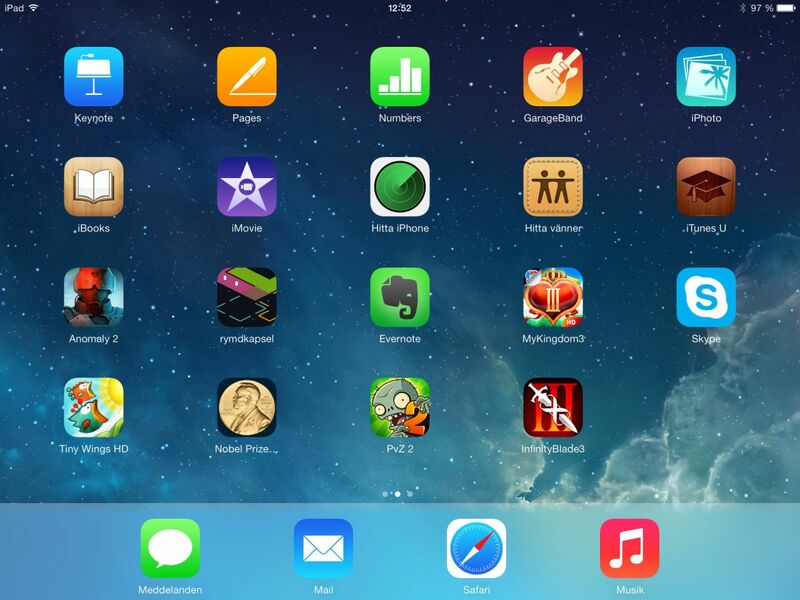 As expected iPad Air comes with the latest iOS 7 (up to iOS 7.03 at the time of writing). The new version of iOS comes with some nice new features like a much better notification system as well as a new design language that is flatter and more modern. Overall though iOS has not changed that much since the launch of the first iPad and we still get the same grid-like GUI. True, we can create folders with applications but it still feels like a pretty stale GUI and we really miss the flexibility that Android gives us in terms of widgets. I also miss being able to switch out the keyboard for something like Swiftkey. I can’t help but feel that the software is holding the iPad back a bit since the icon grid GUI does not feel like the best use of the screen estate of the iPad. Where iOS shines is the amount of apps available. 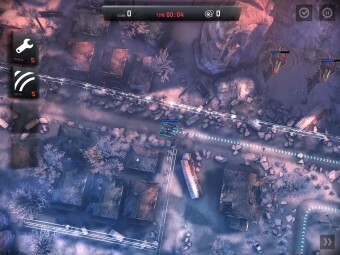 Even though the iPad may have lost market share to Android tablets iOS still is the main target for developers and thus you can almost always count of an app or a game to be available for the iPad. The problem with so many apps is that you have a hard time finding them and this is the case for the Apple Appstore. 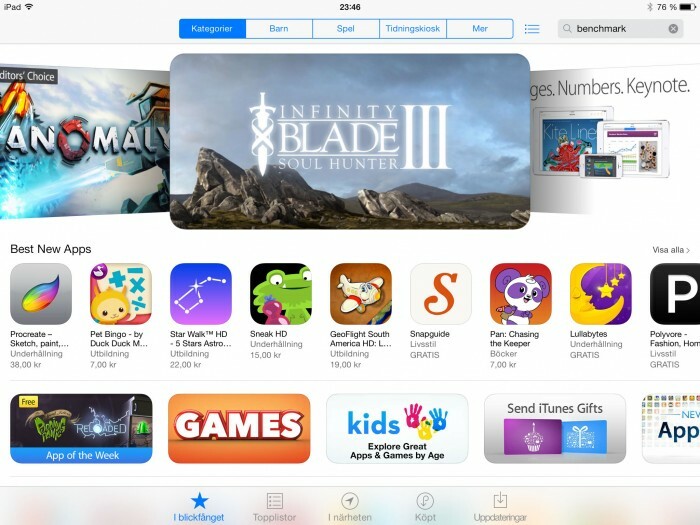 Unless an app or game is on one of the lists that Apple compiles it is hard to find them. Apple works hard by creating tons of lists with kids’ games, racing games and so on and this certainly helps with app discovery. This is an area Google should work harder on emulating in their Google Play store. One wasted opportunity with iOS 7 is the lack of multi-user support. Now that for example the Nexus 7 2013 comes with full support for limited user accounts it is a mystery why Apple has not added something similar to iOS 7 for the iPad. It should not come as a surprise that many families share their iPad between adults and kids and being able on the OS level to set up accounts for the kids with limited access to certain apps should not be that hard. I am sure Apple would rather we buy separate devices for each family member, but not every family has that kind of money. 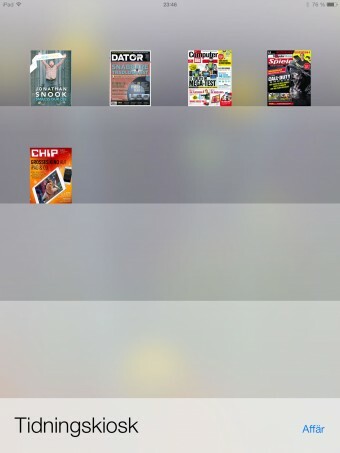 One area where the iPad Air shines due to it’s 4:3 aspect ration is reading comics and magazines. In addition to the iTunes Magazine stand there are a lot of other reading applications which sells digital magazines and comics. 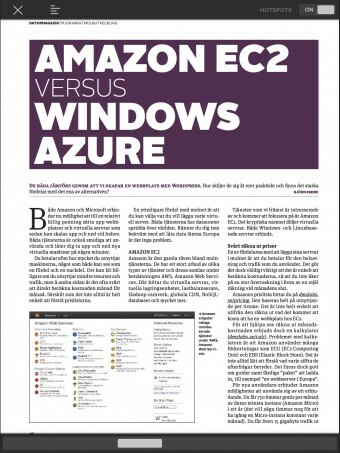 Due to the high resolution screen the iPad Air is an excellent reading plattform for magazines. Just as the 4:3 aspect ratio is perfect for magazines it is not as good for videos and movies. 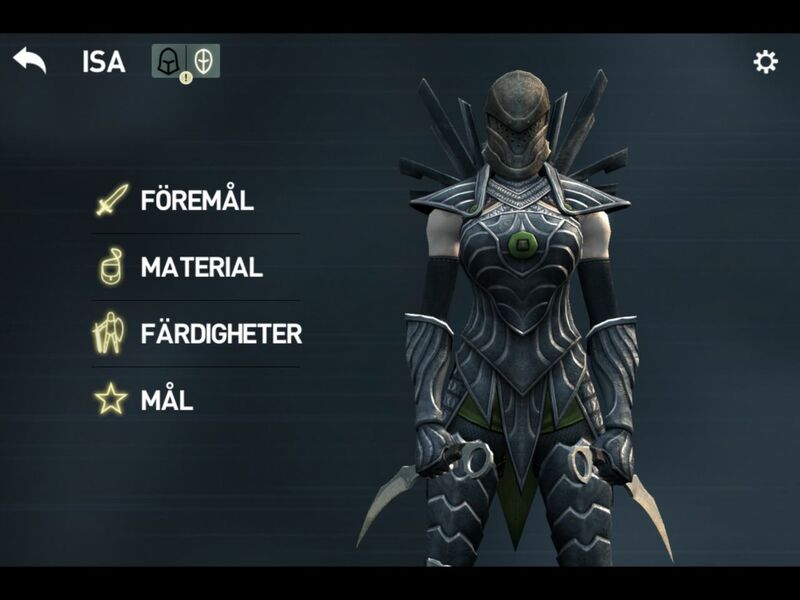 You cannot get away from getting some black borders. The native file support is abysmal but with third party apps you can even play high definition MKV files. 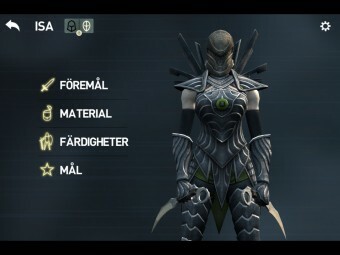 Since the iPad Air comes with a top of the line SoC it is no wonder that it runs even the most demanding games like Infinity Blade III without a hitch. In fact, you might wonder if the power is almost wasted in 99% of the cases. 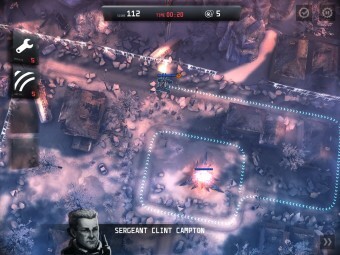 As expected the experience when navigating iOS is smooth and laggfree. 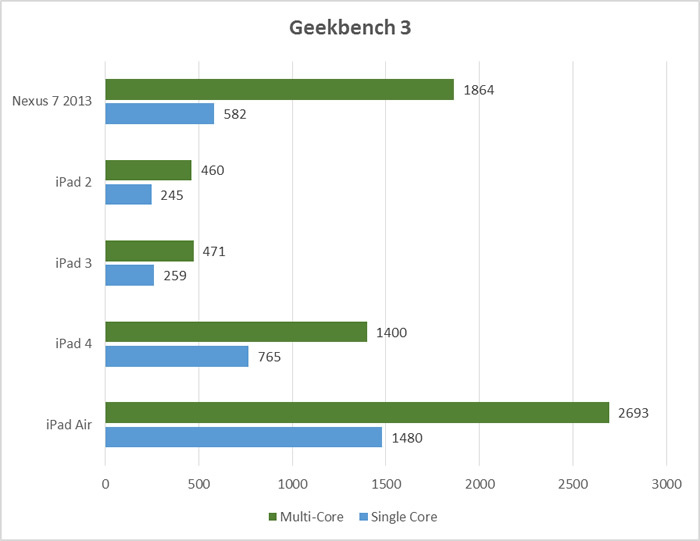 Geekbench is a crossplattform processor benchmark that simulates real-world workloads. As expected the iPad Air wipes the floor with the older iPads as well as the new 2013 Nexus 7. 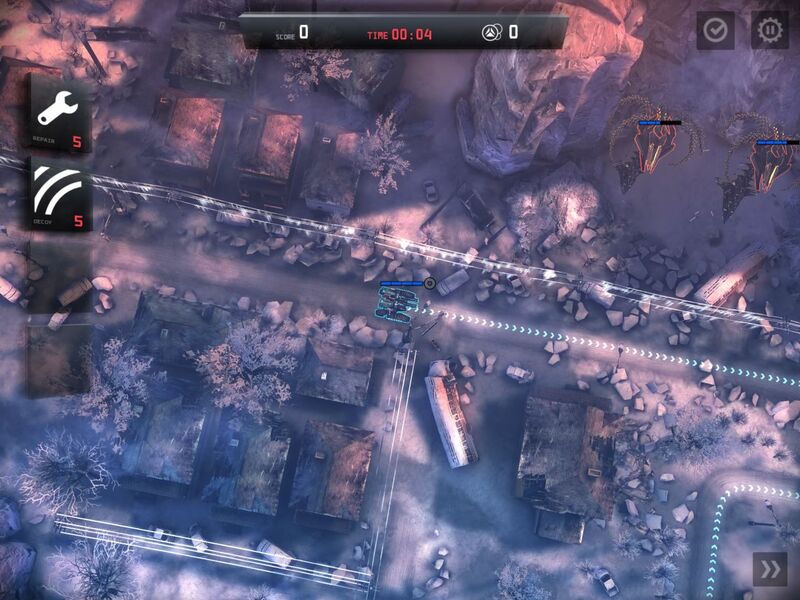 GFXBench is yet another cross plattform benchmark. 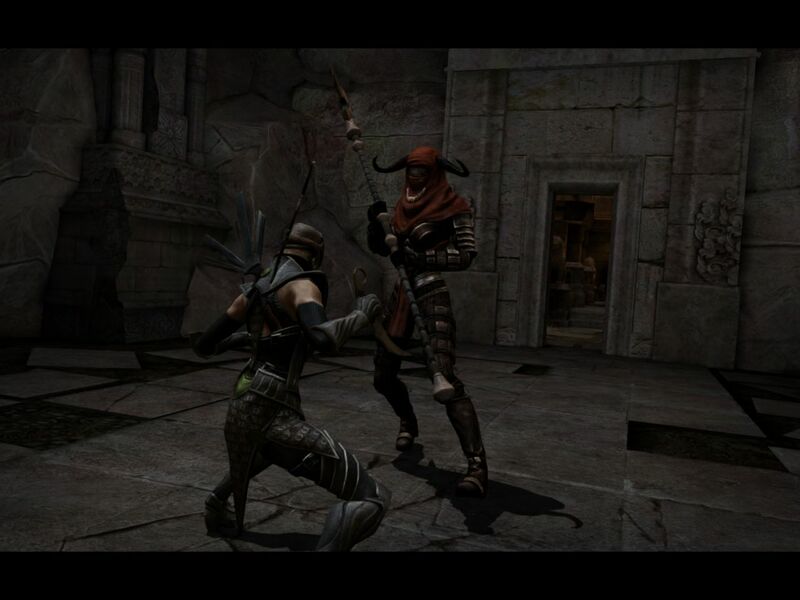 The two tests we chose here render two different scenes with nice shiny graphics that tax the devices. 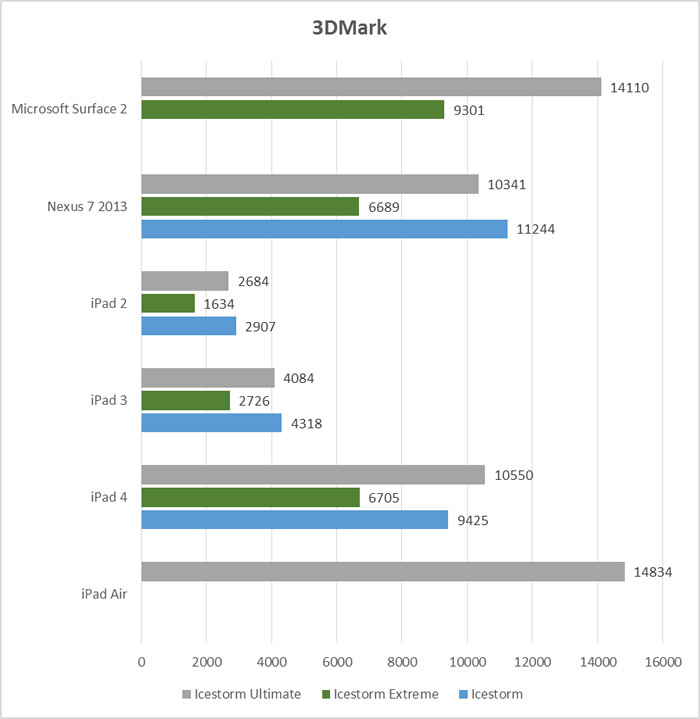 Again the iPad Air shows the older iPads, the 2013 Nexus 7 and the Microsoft Surface 2 who the king of performance is. 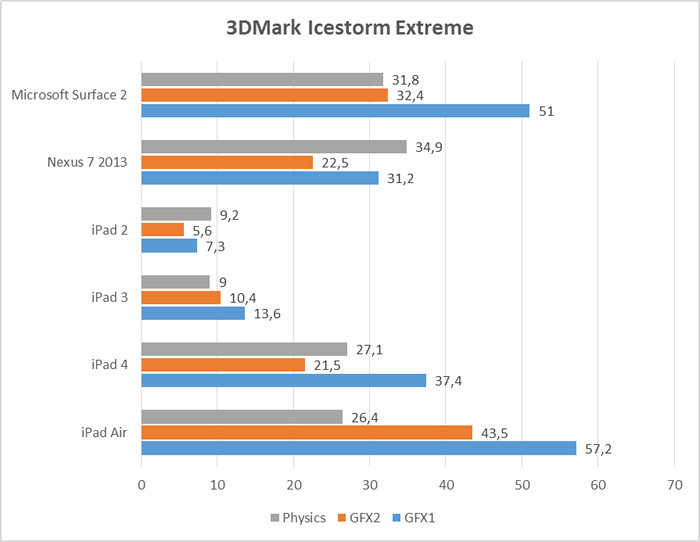 Futuremark has also released the latest 3DMark for mobile products so we can use it to compare the iPad, the Nexus 7 and the Surface 2. In those cases where a result is missing it is not because the test did not run due to an error, it is because the software said that the score was “maxed out”. 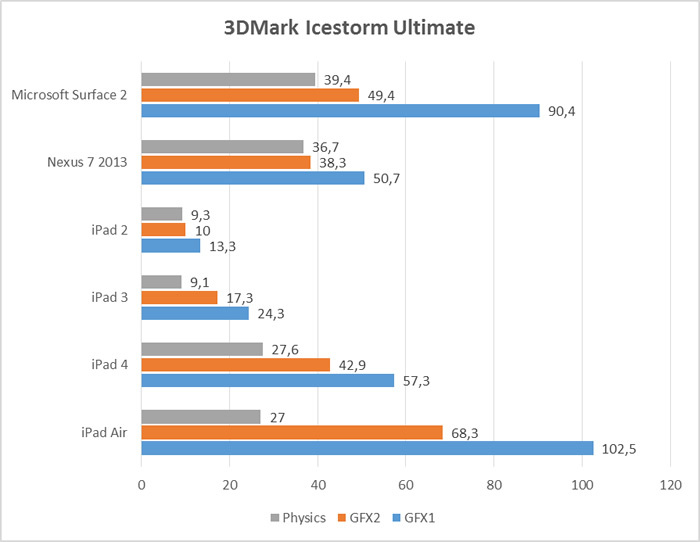 So the Surface 2 did not get any scores on the default 3DMark Firestorm because it was deemed “too fast”. We notice something interesting here. 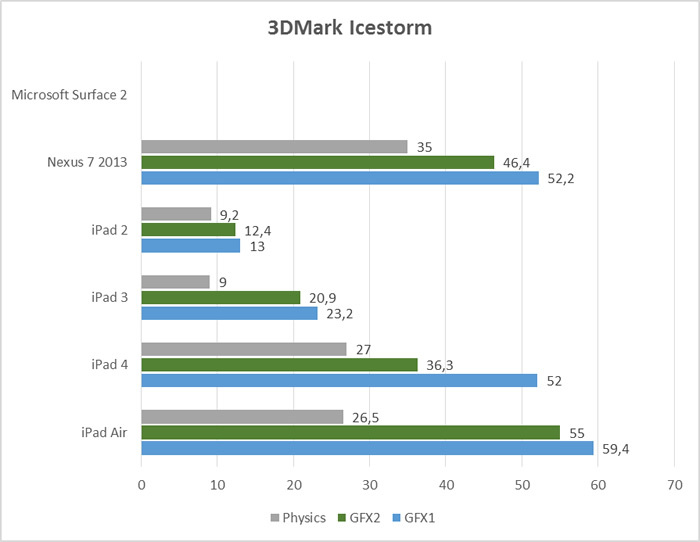 The iPad Air performs the best when we look at the graphics score but when it comes to the physics test it falls behind both the Nexus 7 (Qualcom Snapdrag 800) and the Surface 2 (Tegra 4). The new iPad Air is by far the best iPad right now (at least until the new iPad Mini which might take the crown). What Apple has done with the table is impressive. While the iPad 3 and 4 felt heavy and quite bulky the iPad Air feels light and slim. What brings it down a bit is the software, which even though iOS is brand new is starting to feel dated. Is Apple to stubborn to think widgets or “active” tiles/icons or will we see innovation also in that area in the future? The notification bar shows that Apple is able to get influences by the competition so we can only hope they spend some time plucking the best bit both from Android and Windows 8/Windows Phone 8. Still, if you want a ~10 inch tablet today the iPad Air simply is one of the best you can get. If you already are in the Apple ecosystem and have a iPad 1-3 then it is a no-brainer, this is an update that is worth the money. If you got a iPad 4 though you might want to think about if you really need the extra speed and the slimmer package. In addition the the $499 model we are reviewing today Apple also have models with 32, 64 and 128 GB as well as models with 4G LTE that even works around the world. We would suggest getting at least 32 GB as many of the newer high-end games take up a lot of space and movides and music also eat a lot of space. Even though the iPad Air faces stiff competition these days we still think it is good enough to deserve the Golden Bear Award. Apple has managed to make the iPad Air both thinner and slimmer and it simply is one of the best 10-inch tablets you can buy today.